The terroir of the Olifants River can be described as diverse in a climatic sense. The biggest climate driver in the area is the Atlantic ocean and proximity to the ocean determines the climatic conditions. Mean February temperatures ranges from under 20°C at Lutouw 7km’s from the ocean to just over 25°C in Trawal 35km’s from the ocean. Our red and yellow/brown sandy loam soils are well suited for a range of Cultivars for quality wine production. On the riverbanks the soils can be described as alluvial with good water holding capacity for bigger canopy growth. The terroir of the Olifants River can be described as diverse in a climatic sense. The biggest climate driver in the area is the Atlantic ocean and proximity to the ocean determines the climatic conditions. Mean February temperatures ranges from less than 20°C at Lutouw 7 km’s from the ocean to just over 25°C in Trawal 35 km’s from the ocean. Our red and yellow/brown sandy loam soils are well suited for a range of cultivars for quality wine production. On the riverbanks the soil can be described as alluvial with good water holding capacity for bigger canopy growth. The Olifants River region runs in a belt along the broad valley of the Olifants River and incorporates the stand-alone Lambert’s Bay ward on the coast and the high-altitude wards of Piekenierskloof and Cederberg, a stand-alone appellation which borders on this region. The southern part of the valley up until Clanwilliam has an annual average rainfall of 370 mm. Irrigation is obtained from the Clanwilliam dam, where the water is of an excellent quality. The soil are mainly sandy alluvial soil from the surrounding Table Mountain sandstone mountains. The climate of the high-lying inland ward of Piekenierskloof is conducive to organic cultivation. Isolated high-altitude vineyards are also found in the stand-alone Cederberg ward. Average temperatures are cooler than in the valley and average rainfall is higher. The valley stretches from predominantly citrus producing Citrusdal in the south, to Koekenaap in the north. Further north, the river turns back towards the south-west and flows into the cold Atlantic Ocean. Intensive viticulture takes place in this part of the region, which incorporates the wards of Vredendal and Spruitdrift, as well as the cooler, sea-influenced wards of Koekenaap and Bamboes Bay. Here the average yearly rainfall is 220 mm. Medium textured, very fertile alluvial soil are found on the lower river terraces, while reddish-brown, medium-textured, calcareous duripan Karoo soil, similar to those of the Klein Karoo, are found on the higher reaches. Red windblown sand with underlying calcareous silcrete layers can be found in isolated areas on higher landscapes. The alluvial and reddish-brown Karoo soil are very rich incations and phosphate, and often contain free lime. Closer to the cold Atlantic Ocean in the vicinity of Koekenaap, vineyards can be found where cooler climates ensure high quality slow-ripening grapes. The most widely planted white wine variety in the Olifants River region is Chenin Blanc and the main red wine varieties are Shiraz, Pinotage and Cabernet Sauvignon. 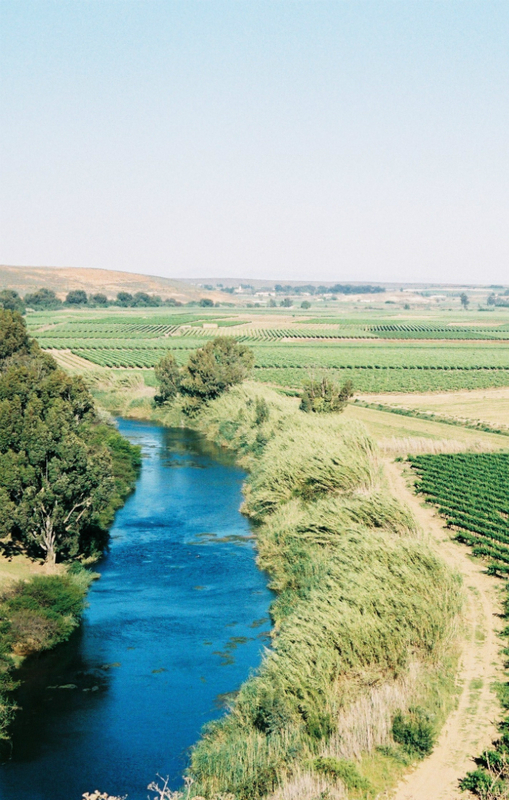 With careful canopy management, which ensure grapes are shaded by the vines’ leaves, combined with modern winemaking techniques, the Olifants River is proving to be a source of quality, affordable wines.